Glad I hit upon your blog. Was thinking of working on documenting life in Spokane for outsiders. May still do. Do it! A possible angle is to look at what we think about our area versus what the reality is – the weather chart is a good example. 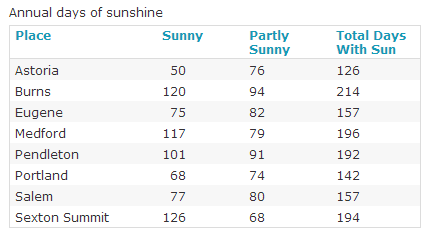 The weather chart is a good example – everyone thinks we are sunnier and warmer than Seattle. And we are, but not by nearly as much as most seem to believe. When we set expectations wrong for visitors or those moving into the area, they will soon figure out how things are and leave them with feelings of betrayal. Better to be a straight shooter. Feel free to reference the data on this web site, and the links to other data sources that are spread throughout the articles and more in the right hand column. I moved to Spokane after hearing sunny days were over 200 annually. I have been here 14 years now and realized it was for the four seasons that I chose Spokane. I have not been disappointed. There is so much to get involved in sports and hobby-wise. I am never bored and am very happy with the decision to relocate here. Thank you Spokane.